SEDA equipment and devices for the drainage of end-of-life vehicles lead the way worldwide. SEDA has revolutionised issues such as explosion protection, reliability, simple and safe handling. Integrating SEDA equipment in existing processes and expandable elements provide flexibility. The topic “dismantling” of end-of-life vehicles is more important than ever in the future. Too many recyclables are installed in automobiles that are not only valuable, but also can be used in the production of new cars. SEDA provides numerous dismantling tools and equipment. Our highly rated special tools range make car recycling even more professional. Specialised devices including a CableCutter, a refrigerant recycling machine or a CableShredder round out our comprehensive range for recycling facilities, workshops and rescue services. SEDA testing equipment such as our radiator or Co² testers are in use around the world. Multi-functional testing systems and proven pressure testers form an integral part of the SEDA product range, and have been relied on for many years now by companies including Daimler, MAN and Würth. For companies with dismantling rates of 5.000 up to 18.000 vehicles per year SEDA and cooperation partner Re-source Engineering Solutions offer an all-in-one solution. 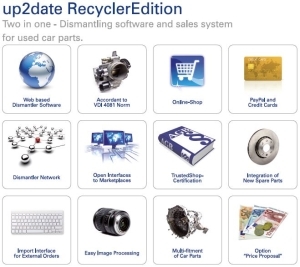 Optimize your working processes in car dismantling through the use of a professional software solution (up2date RecyclerEdition) and focus on online sales. Dismantling software up2date Recycler Edition covers all relevant processes of the vehicle acceptance, dissambly, documentation, warehousing and multichannel distribution of parts and vehicles. The modular structure and open interfaces ensure optimal integration into business processes. For a personal talk or a demonstration please contact our partner KUMAsoft.